Click on a thumbnail below for a larger view or click here for a detailed view of Angela's work. The work of Angela Edwards always embraces contemporary issues, this being very evident in the subject matter presented in this exhibition. Her medium is varied, ranging from charcoal on Fabriano paper to oil painting on canvas or board. The subject matter and composition is gleaned via digital media, such as video stills, streamed news, or shots via her iPhone, hence there is in production, a conflation of new technology with traditional methods. The photographic shot grabs a unrepeatable moment in time but in this artist’s work, the image is reclaimed and transformed into another form of representation; a simulacrum from something that was real into an imitation, with the pictorial elements creating a type of hyper-reality. As such, the representation of people moving within the space, shows them as anonymous participants, active in a specific point of time, namely a ‘moment’. The spectator here is invited into the dialogue of this ‘moment’, for example, it could be construed that the viewer is active, following the forward moving, or, encountering the approaching images and is therefore witness to their presence. Furthermore, the technique of placing some part-images at the edge of the picture plane informs us that there is more of life to be experienced beyond the confines of the frame. It can also be noted that the normal photographic process is challenged within the oil painting technique, for each canvas/ board starts with a very dark ground from which the highlighted, tonal images emerge, this being a reverse process to that which takes place in a darkroom developing dish. As viewers, there is much to think about from these works with purposeful meanings present, one being, the consideration that in our daily activity of rushing and pushing through time and space, almost with robotic clarity, there is a certain sense of alienation and we perhaps need to take on a kind of mindfulness and question reality and ‘the real’ in our ever expanding virtual world. 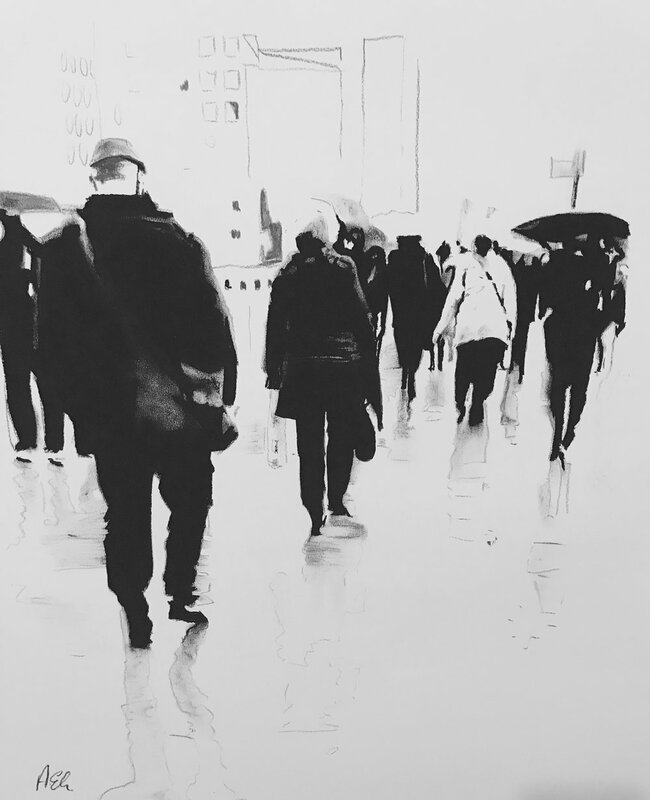 Angela has over many years developed her practice in life and figure drawing and in 2014 gained a first class honours Degree in Fine Art Painting. Watch as Angela Edwards painting comes to life as she reveals each brush stroke.